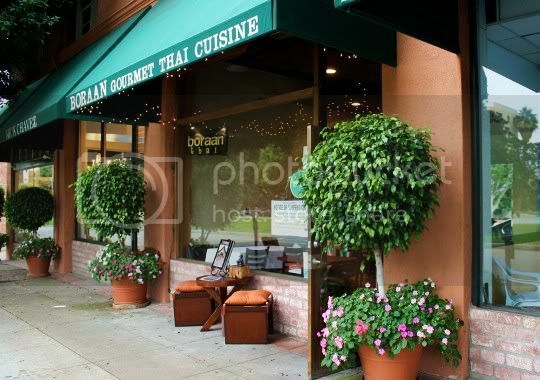 Hidden along a heavily tree-lined street in the Robertson-Beverly Hills area sits Boraan Thai; drive slowly, or you might miss it. A tiny, quaint restaurant with Thai-influenced decor, especially the cute little table and stool arrangement placed outside that prominently features a huge book on Thailand. This is also the first restaurant I've reviewed where the employees became super suspicious once they laid eyes on my camera. Well sure, I was standing outside trying to get photos of the restaurant front; but maybe their anxiety had something to do with the the huge liquor suspension sign posted in their window. Hey, not my fault! Anyway, the actual restaurant interior is SMALL yet cozy. There's probably seven tables in the entire place, but everything is clean with minimalist design. The decor is zen-like, with dim lighting and neutral earth tones throughout. There's lots of dark wood furniture--tables, chairs, and benches--with clean white tablecloths and green silk pillows for each bench. There isn't much natural lighting unless you're seated right near the front windows, but the place does have a warm, homey, dining room feel. 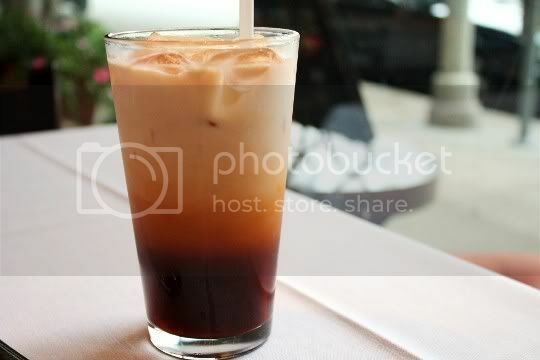 A standard Thai beverage, and this one was no different. It was very sweet, but not super rich and thick like some can be (which is a good thing, in my opinion). 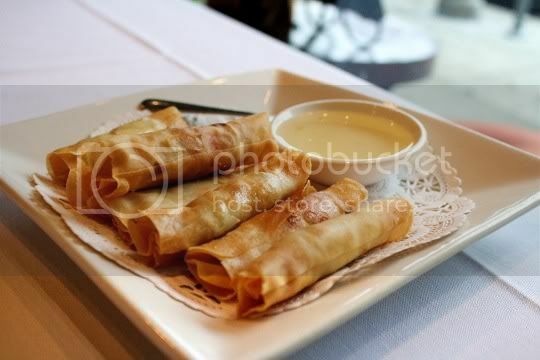 I absolutely LOVED this take on traditional egg rolls. Yes, they tasted like the regular ones with the typical carrot, cabbage, black pepper, rice noodle, and celery filling...but these were light, extra crisp, and not overly greasy. These mini skinny rolls would be great for sharing, as opposed to the usual thick and bulky Chinese-style rolls. The dipping sauces were good, although I don't think I've ever seen a sweet and sour sauce that wasn't red or pink. Interesting. But it was nice and sweet, and thick and syrupy, perfect for dipping. The server had initially told me they were out of taro (the starchy, potato-like root), but then I suppose some magically appeared and I was able to order this dish after all. Honestly, after the first few bites, I had hoped that it would have stayed missing. It's an interesting dish of tofu skin-wrapped sliced taro--battered with nuts, cilantro, corn, and probably some other stuff--and deep-fried. I was actually expecting a combination of fried taro and tofu "sticks," but this wasn't quite it. Each piece was super crunchy and crispy, but after a few bites, I felt it was too greasy and dense. Not to mention those taro slices were rather thick, and after the lightness of the Crispy Vegetable Roll, this just went in the complete opposite direction. The dipping sauce was a half-and-half combination of the clear sweet and sour next to a spicy, tangy red chili sauce. It was covered with chopped peanuts, which really weren't necessary considering all of the excessive crunch from the taro. It's too bad that this is one of the only few veg appetizer options on the menu, because I definitely wouldn't order it again. This delicious, hot and steaming soup definitely hit the spot, especially after I was assured only vegetable broth was used with the tofu version. While not as tangy as most varieties I've had of this soup, it was still spicy, sour, and wonderful. I also really appreciated the simplicity of it. 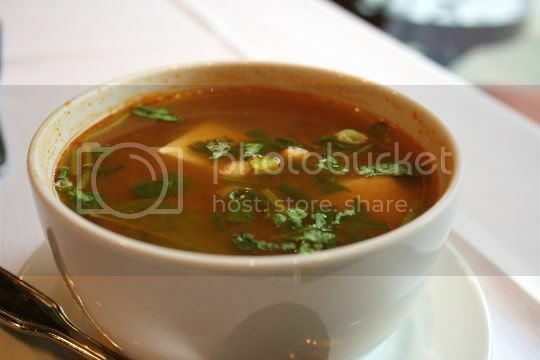 A soup like this is really all about the broth, and lots of broth had I. The only other additions were four big cubes of tofu, a few mushrooms, some greens onions, and some cilantro. I finished the whole thing! Another Thai favorite of mine, I wanted this sweet and salty noodle dish to be the star of the meal. Alas, it was just decent, and upon first bite, I knew I'd definitely had better. The big flat noodles were a bit too sticky and dry, and while the sauce was sweet, it wasn;t really salty and savory enough as it should have been (more black bean sauce please!). I did, however, taste the "toastiness" of lots of sesame oil. Surprisingly, there wasn't much egg throughout, but there was plenty of both regular and Chinese broccoli. However, the biggest disappointment of this dish was probably the OVERLY greasy fried tofu cubes. I mean, I know they were fried...but sheesh. One bite, and there's grease spurting everywhere. Not cool. Overall, the dining experience was decent, but probably not decent enough to bring me back. With the hundreds of Thai restaurants throughout LA, the food's really gotta be something special. Boraan Thai, unfortunately, doesn't quite pass the bar. Which Thai Restaurants would you recommend for having freshest vegetables, most variety? I don't want to order the fake meat products. thanks! Great question! Honestly, I can't think of any specific restaurants. How do you feel about eating tofu? 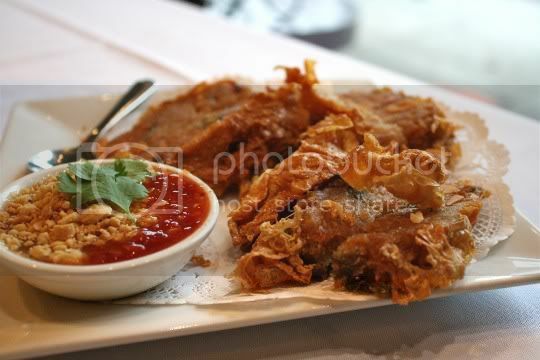 Usually, that's always an option in Thai restaurants, and you can opt for deep frying or sauteeing it. 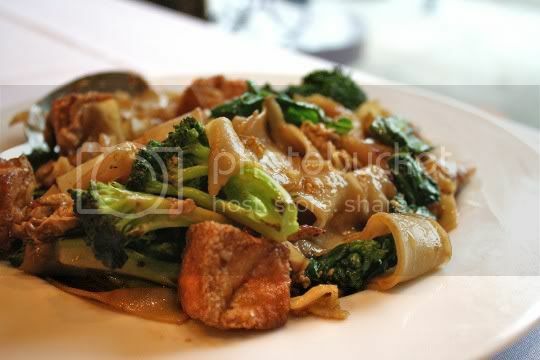 As far as only eating veggies, many Thai restaurants have "wok" or "stir-fry" sections on their menus. This usually gives you 10 or so different veggie/sauce combos, with the option to add a choice of meat or tofu. My suggestion would be to just order the stir-fry itself, without any additions. Then, you could say extra broccoli!